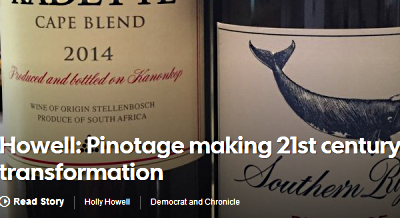 Sommelier and columnist Holly Howell, writing in New York’s Rochester Democrat and Chronicle, recommends Kanonkop Kadette Cape Blend 2014 and Southern Right Pinotage 2015 in the second of two articles* marking International Pinotage Day. has the texture and body of a good Bordeaux. But the flavors are definitely Pinotage-driven — ripe berries, roasted coffee beans, dark chocolate and smoke. is reminiscent of a fine red Burgundy, with elegant aromas of black raspberry, autumn woods and baking spice. But once you take a sip, you are welcomed to the New World with flavors of cassis, dark plum and cinnamon coffee. This wine is a game changer, and a must try for any Pinotage doubters out there.